The Campbell Brothers, pioneers of sacred steel, thanks to late, great Jimmy Day. The audience stretched as far back from the Zilker Park stage as the eye could see on the last night of the first Austin City Limits Music Festival. When Robert Randolph and the Family Band hit the stage that September night and played an old church song, the audience dug in. But then, without warning, the four-piece cut loose on a torrid slide number — the 1969 Allman Brothers times five — and the crowd practically levitated. They wouldn’t touch down for the next hour or so. What was unique about this case of pandemonium was that it was caused by a man sitting behind a pedal steel guitar, an instrument more closely associated with luaus and country dancehalls. Randolph doesn’t merely play the instrument, he pilots it. In his hands and under his feet, it soars, it swoops, it blasts into the stratosphere, looking for Jimi and Jesus at the same time. When he’s overcome by the spirit, Randolph kicks back his stool like Jerry Lee Lewis and does a wild dance he calls “The March.” You’ve never seen or heard anything like it. Much as the once-derided accordion became cool when the likes of Clifton Chenier and Flaco Jimenez snatched it from “The Lawrence Welk Show,” the steel guitar has taken off with the “Sacred Steel” phenomenon, a new way to rock that comes from a 65-year-old tradition. The Campbell Brothers, Aubrey Ghent, Sonny Treadway, Calvin Cooke, Maurice “Ted” Beard and many more gospel steel players have taken their talents from the House of God, a black Pentecostal church with 200 congregations in the United States, to concert stages all over the world in the past few years. But the biggest star is Randolph, who sports cornrows and hip-hop clothes to match a swaggering stage presence. When Warner Brothers picked up his “Live At the Wetlands” CD last year, the 24-year-old from Orange, N.J., became the first steel guitar-playing frontman ever signed to a major label. “I can’t see myself as some kind of star because of the church experience,” Randolph says in a phone interview. “We were taught that everyone has got some kind of special gift from God. If your gift is playing music, it’s no better than someone who might have a gift as a plumber.” But nobody gets lost in their emotions when their sink is fixed. Growing up, Randolph played drums at church, but he thought his special talent was basketball and he put up good numbers on his high school’s freshman team. After his parents divorced during his sophomore year, though Randolph starting cutting classes and hanging out with the wrong crowd. He also stopped going to church. Then, when he was 16, he got hooked. He started playing a lap steel given to him by one of the Campbell Brothers, a sacred steel group that often sat in at the House of God Church in Orange. Soon he moved on to the more challenging 13-string pedal steel model. 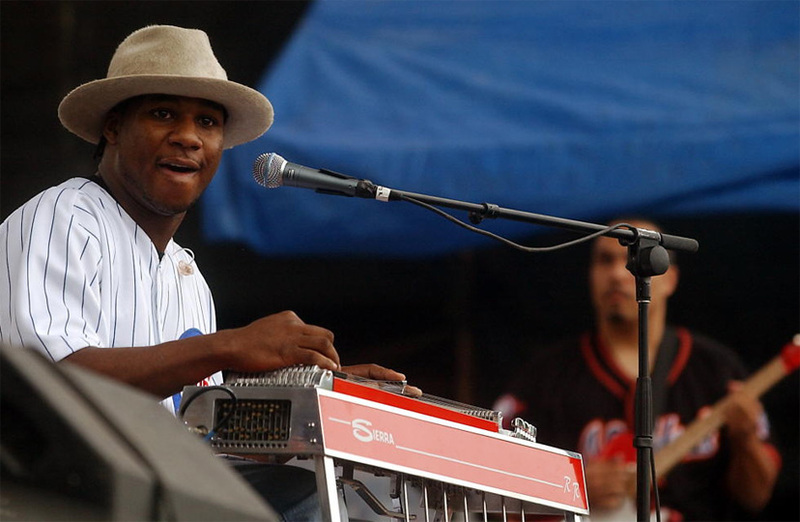 Robert Randolph destroyed the maiden ACL Fest, but the Campbell Brothers led the way on pedal steel gospel music. younger brother a few licks. Rather than follow his brother’s more traditional Polynesian style, however, Willie played as if his music was the lyric of his soul, developing a flamboyant single string lead style that mimicked the singing voice. Willie Eason was also responsible for spreading sacred steel to the House of God hotbed of Florida (which has nearly 50 congregations). In 1940, he married Ocala, Fla., native Alyce Nelson, whose younger brother Henry Nelson became fascinated with his brother-in-law’s “talking guitar” style. Nelson added a driving strum to the style of gospel steel that would become a House of God trademark, passed down through the generations. 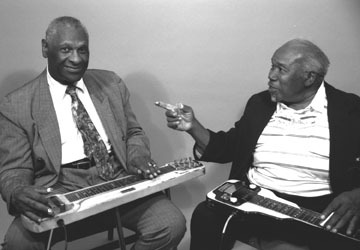 Henry Nelson and Willie Eason, the two most influential sacred steel players. Sol Hoopii, the master of Hawaiian steel. note,” says musician and ethnomusicologist Bob Brozman. 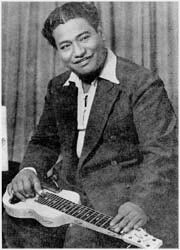 “He had a jazzman’s instincts, and in the late ’20s, early ’30s he took the steel guitar places it had never gone before.” Steel player Jerry Byrd, who left steady Nashville session work for the lounges of Waikiki in 1972, has said that Hoopii possessed the most dextrous picking hand he’d ever heard. Meanwhile, country music pioneer Jimmie Rodgers started hiring steel players from Hawaii in 1928 and popularized the “crying” accompaniment with country audiences. Bob Dunn of the Fort Worth-based Milton Brown and His Musical Brownies was among the first to play electric lap steel guitar in a country band, and Leon McAuliffe’s hit 1936 recording of “Steel Guitar Rag” secured the instrument in the country music lexicon. 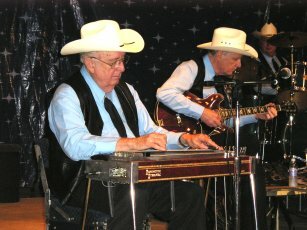 According to Bill C. Malone’s “Country Music U.S.A.,” Dunn became enchanted with steel guitar after seeing a Hawaiian group in his native Oklahoma in 1917 and took correspondence lessons from Hawaiian Walter Kolomoku. Herb Remington of Houston played with Bob Wills and the Texas Playboys. The pedal steel was even a longer time coming to the House of God. It was harder to move around and set up than the lap steel. 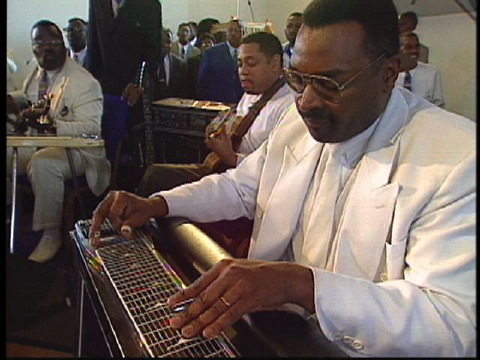 But in the early ’70s the extended capabilities of the instrument made a convert out of Rochester, N.Y.’s Chuck Campbell, a 12-year-old lap steel player who in Nashvillfor a House of God general assembly. He visited the ShoBud showroom and happened upon a demonstration by pedal steel player Jimmy Day (who would later move to Austin, where he played with Don Walser, Dale Watson and others before passing away in 1999). Day used a half-pint whiskey bottle for his slide, but Campbell was more intent on watching the pedals, which allowed Day to switch tunings mid-song. Levers controlled by the knees raised and lowered the strings to change pitch. Suddenly, a whole new world of options opened up to thyoung frontman of the Campbell Brothers. Switching to a pedal steel and exploring eerie tunings, Chuck forever changed his church’s music. If not for a 1992 phone call from a Hollywood, Fla., music store to folklorist Robert Stone, sacred steel would likely still be hidden behind the doors of clapboard country chapels and storefront churches bearing the House of God logo. The music store owner had noticed a growing number of African American men were buying lap and pedal steel steel guitars and playing them in church. He asked Stone if he knew what was going on. Duly intrigued, Stone sought out two of Florida’s greatest steelers, Aubrey Ghent and Glen Lee, and after witnessing them tear it up at the House of God, Stone wrote that he was “unprepared for such intensity.” Using cassette recordings of Ghent, Lee and Sonny Treadway as an enticement, Stone received a grant for $6,800 from the National Endowment of the Arts to produce the first “Sacred Steel” album. When Chris Strachwitz of the Arhoolie label heard the cassette-only release, he made a deal to license the tracks. With “Sacred Steel’s” 1997 re-release, critics fell over each other to trumpet this sinfully satisfying new style of gospel music. The Campbell Brothers’ “Pass Me Not” quickly followed on Arhoolie, and the group was soon unveiling this fresh variation on gospel, rock and blues at festivals all over the world. Randolph, meanwhile, has become a sensation on the jam band circuit with his mix of secular and spiritual material. “The sacred steel guys have gone a ways in showing people that there’s more to the instrument than country music and sci-fi sound effects,” says Austin’s Cindy Cashdollar, who’s doing her own part in expanding steel guitar. The ambient “Locust Grove,” her track on the recent “Legends of the Incredible Lap Steel Guitar” compilation, sounds nothing like the Eldon Shamblin licks she played with Asleep At the Wheel from 1992-2001. But where Randolph says he’s still learning the intricacies of the complex conspiracy of wood, wires, pedals, necks and levers that he seems to control so intuitively, there’s no doubt that he’s the main messenger to the masses. If the Campbell Brothers are the Bill Haley and the Comets of sacred steel, Randolph is its Elvis Presley. Astonishingly, this house-wrecker played his first public concert only three years ago. His first studio album with the Family (featuring cousins Marcus Randolph on drums and Danyel Morgan on bass, with B-3 player John Ginty) is months away from the shelves. Get in a field with this group and be transported by the possibilities. The horizon has a heavenly glow.